Platinum, 18 kt yellow & rose gold. 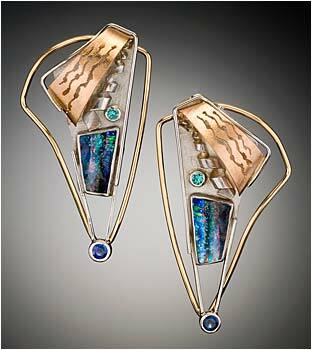 Boulder opal slits – tw. 7.30 ct., teal colored diamonds ( treated), 2 stones with tw. .21 ct., blue sapphires, 2 stones with tw. .77 ct. Pierced with omega clips.